Today I’m going to write about a much requested topic, on how not to gain weight during this beautiful season. We all know that the party season is tricky, we have our friends and families over, we make festive dinners, lot’s of snacks, desserts and not to forget about the drinks. So Christmas is all about enjoying life, family and friends, relaxation and eating. Speaking about eating, I personally always eat whatever I want to eat – and that is healthy. But if I want to enjoy an unhealthy Christmas meal once or twice, I definitely do it! BUT please be aware, just because you ate an unhealthy breakfast this morning does NOT mean the day is ruined. Just because you’re going to eat a big piece of cake and some pie this afternoon does NOT mean you should continue in that direction with dinner too. What I mean is, if you’re going to eat ONE bad meal, you still have the opportunity to eat two really good meals afterwards. As I wrote in my previous articles one bad meal does not make you gain weight. It’s when that one bad meal is followed up by a week of bad meals now that’s a problem. Eat a bad meal and move on! A common mistake is overindulging on high-fat pastries, chips and dips while waiting for the “real” food to arrive. Avoid overeating by ensuring you do not arrive at an event starving. Have a filling snack 60 to 90 minutes before you go. On a Christmas dinner table there are plenty of foods to choose from. In my opinion it’s not a good idea to choose the slow carbs like mashed/fried potato, or pastries, crackers and breads. Too much slow carbs will make you feel bloated, and with a very low nutritional value. So if you ask me I say, you better choose some ham, eggs, vegetables, meat balls, some olives,cheese and lots of vegetables. 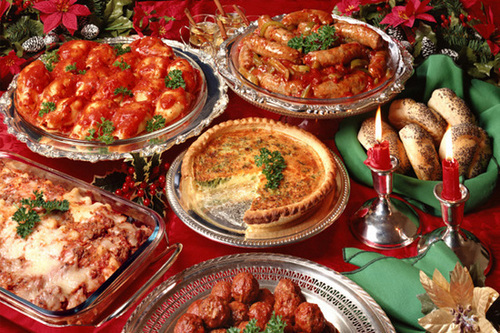 I don’t know how you celebrate Christmas, but in my family we love to eat a lot and often during the winter holidays. So I always make sure to not overeat. Not only is the food bad enough at most holiday parties, but the drinks can really add up some calories quickly. Many of the fancier cocktails that people opt for can easily pack 200 or more calories per glass. Do yourself a favour and plan to either treat yourself to something food-related or something drink-related. Not both. This will at least limit the amount of additional calories you are taking in at any given meal. Dilute wine and spirits with ice or mineral water, ask for light beer instead of full-strength or intersperse a juice or sparkling mineral water between regular drinks. Have something to eat before you drink to slow the absorption of alcohol into your system. Don’t let Christmas run until January. Your body has no idea that it’s holiday season, it’s just another day. So the day after, treat it like the rest of your healthy days. The day after the big dinner take corrective action, doing a bit more cardio and cut back on your carbohydrate or fat intake. Well these are the tips that I have for you right now. If you have some other tips, please write in the comment field! You truly helped me comprehend this idea with your informative post, thanks for all the hard work.